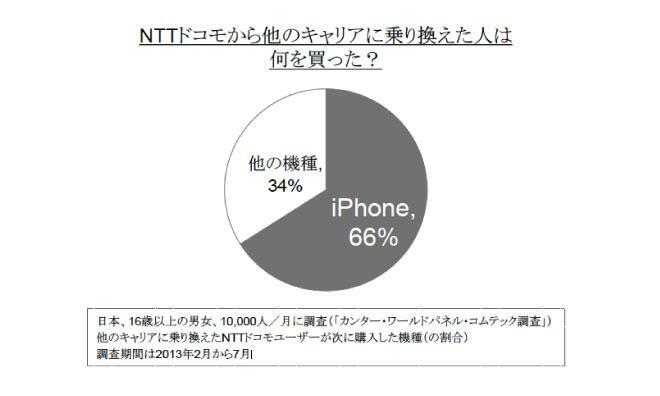 Nearly seven out of every ten customers who recently defected from NTT's DoCoMo mobile communications unit switched carriers because of the iPhone, according to new research from Japanese firm Kantar. The survey, conducted from Feburary to July 2013, shows 66 percent of switchers did so because of the iPhone. Apple's iPhone remains a strong driver of consumer choice in Japan's wireless industry as 66 percent of survey respondents who recently left DoCoMo indicated that they moved to a new carrier specifically to get the popular smartphone. The study, uncovered by The Next Web, was conducted via the Internet from February to July of this year and surveyed 10,000 men and women over the age of 16 each month. DoCoMo, a unit of Japanese telecommunication giant NTT, is the largest wireless carrier in Japan, with more than 61 million subscribers. Despite counting nearly half of the Japanese population as customers and showing year-over-year gains in total subscriber numbers, DoCoMo's share of the overall Japanese mobile phone market is on a downward trajectory  the company shed nearly two percent of its share between 2012 and 2013, ceding ground to SoftBank and au's KDDI, both carriers that offer the iPhone. These troubling signs, combined with the recent survey results, may help explain why DoCoMo reportedly promised Apple that 40 percent of the carrier's sales would be of Cupertino's handset. Carriers are a key channel in Japan's mobile phone marketplace, and not only for the subsidies they provide  phones are not usually sold unlocked in Japan, and bring-your-own-phone SIM-only plans that are popular elsewhere are rare. These and other factors are why some believe that the deal with DoCoMo, as well as China Mobile, may drive up to 35 million additional iPhone sales in 2014.